Researchers detect carbon nanotubes in the lungs of French children. Too small to see, but still worrying. In 2007 a team of Swiss researchers published a review paper about the possible human health risks posed by carbon nanotubes—cylinders, made of carbon atoms, that show promise in numerous research fields because of their impressive tensile strength and chemical attributes. “CNTs produce a toxic response upon reaching the lungs in sufficient quantity,” they wrote. The next year, Scottish scientists memorably compared CMTs to asbestos after completing a pilot mouse study. 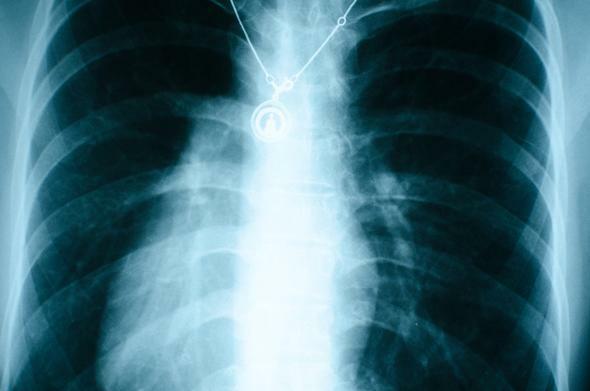 Now French researchers have detected CMTs in human lungs for the first time. Surprise! A study published earlier this month in EBioMedicine analyzed the particles from polluted air that ended up in the “lower airways” of 69 Parisian asthmatic children (64 airway fluid samples and five lung cell samples). The researchers found nanotubes in every human sample and also found them in dust and car exhaust around Paris, using high-resolution microscopy and X-ray spectroscopy for their analyses. “We show that inhaled [particulate matter] mostly consist of CNTs,” they wrote. “These results strongly suggest that humans are routinely exposed to CNTs.” The study does not establish a source, nor does it suggest a causal link between nanotubes and childhood asthma. James Bonner, a toxicology researchers at North Carolina State University in Raleigh, told the New Scientist that it’s still unclear what exactly the French research team has identified. “In my opinion, there is a great deal of uncertainty as to what these structures really are, especially the material in the lung cells from patients,” he said. Some propose that the structures are not the same nanotubes being manufactured for research and development, but byproducts of fossil fuel processing (meaning humans have been exposed to them for hundreds of years). It’s always eerie, though, when you think something might happen and then it happens.